and shot itself in the head with respect to North Korea with all the chest pounding idiocy and bragging of a bullying teenager hopped up on crack surprised when he’s told he’s not welcome to the party because he’s an insulting jerk. But the American press were quick to denounce North Korea’s objections to American bullying as a return to “their old behavior” to try to escape the blame for the fiasco they have created in the Korea-US negotiations. Some commentators have even suggested that Bolton and Pompeo are trying to deliberately sabotage the negotiations with their wild talk but the stunned silence from the White House, Bolton and Pompeo indicates that it was not deliberate but a direct result of their arrogance and stupidity. An opportunity for peace in Korea is being thrown away because of the personal crudeness and barbarity of these people but they are the “in your face” face of American capital; the lieutenants of capital prepared to commit every crime to serve and protect their bosses interests. That the face of American capital has become even uglier lately reflects the steady weakening of their position in the world. A day later Jean Claude Juncker president of the European Commission stated that the European Commission will activate a law that prohibits European companies from complying with the American “sanctions” against Iran. 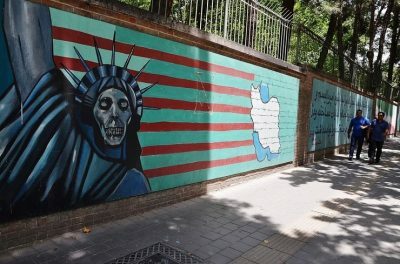 The problem is that it is not very effective but the point is made that the EU regards the American sabotage of the Iran deal as an attack on its companies, a form of economic warfare that it does not appear to be willing to tolerate. The law was first used to counter American sanctions against Cuba but has never really been used. Nevertheless the European Commission has pulled another arrow from its quiver and stated that the European Investment Bank will be used to assist European companies investing in Iran to counter the loss of US financing. Defying the US will not be easy since most European companies have more trade with the US than with Iran and do not want to risk losing all that business. However, if they kowtow to the US they risk losing out to China which will quickly fill the gap if US sanctions force Europe’s companies to withdraw from Iran which has the prospect of becoming the most lucrative market in the entire Middle East. In fact, Chinese companies have already announced plans to expand their activities in Iran. Just a few days ago, a freight train set out from the People’s Republic of China to inaugurate a new transport link from China to Iran within the framework of the New Silk Road. The US has also lost influence in Iraq as a coalition of the Shia nationalist Muqtada al-Sadr, secularists and the Iraqi Communist Party won the elections and will have to form a coalition government that could force out the remaining 10,000 American soldiers and other mercenaries still in the country which would be the final act in the biggest defeat inflicted on the Americans since they were kicked out of Vietnam. The defeat in Iraq, the defeat of US proxy forces in Syria, and the recent failure of the mass missile attack by the US, France and Britain on Syria are linked to the decision by the US to move its embassy to Jerusalem in an attempt to weaken the Palestinians and to strengthen Israel politically at the same time encouraging Israeli brutality and war crimes no matter what the world reaction may be. Lives mean nothing to them when brutality is all they have left to try to escape the hole they have dug themselves into. The massacres in Gaza are so cruel and outrageous they can be considered a deliberate provocation against Iran, which sees itself as a protector of Muslims in the Middle East. Meanwhile the split between the US and Turkey grows as Turkey also denounced the Israeli crimes and recalled its ambassador. Meanwhile Russia has passed legislation imposing sanctions on the US in retaliation for US sanctions against Russia, continues with the Astana talks with Iran, China and Syria about the war in Syria, continues its peace initiative in Afghanistan and continues to upgrade its superior weapons systems while China continues to modernize its armed forces, expands it navy and has flown its fighter and bomber aircraft over Taiwan in defiance of US attempts to undermine Chinese sovereignty over the island. Yet, while American capital expends vast sums of money on armaments and wars that return it nothing its people continue to suffer a rapid degradation of their conditions. On the 17th of May it was reported by the United Way that nearly 51 million households don’t earn enough to afford a monthly budget that includes housing, food, child care, health care, transportation and a cell phone. That’s 43% of households in the United States. This is the country that Mike Pompeo, the new US foreign minister, bragged was “going to rebuild North Korea.” More like North Korea needs to rebuild America. But this is how out of touch with reality these people are in the American leadership, bankrupt of ideas, ignorant of the world and history, locked into an economic system that cannot provide for even the basic the needs of its working people and without a functioning democratic system for the necessary changes to take place. And what is the result of all this but yet more war and so more war we will have as the collapse of American society accelerates. Christopher Black is an international criminal lawyer based in Toronto. He is known for a number of high-profile war crimes cases and recently published his novel “Beneath the Clouds. He writes essays on international law, politics and world events, especially for the online magazine “New Eastern Outlook.” where this article was originally published He is a frequent contributor to Global Research.